Argentina prop Martin Scelzo admits he is keeping everything crossed that talisman Felipe Contepomi will be fit in time for Sunday's vital World Cup Pool B showdown with Scotland. Fly-half Contepomi suffered a rib injury in the opening loss against England which means the Pumas must beat Scotland in Wellington on Sunday to have any hope of progressing to the quarter-finals. "He's going to be fine and if not he has to be fine," said Scelzo, emphasising the importance of the former Bristol and Leinster fly-half, who is now at Stade Francais. 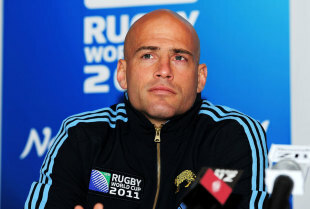 Contepomi is expected to play in the clash at Wellington Regional Stadium and his performance will be key for the Pumas. As will the performance or Argentina's renowned pack. Scelzo, who has been an international since 1996 and won 56 caps, added: "If we want to win the game we need to win the forward battle. "I think the key of the game will be there. Scotland have very good forwards and we have to have our attention on that part of the game." The 35-year-old came off the replacements' bench against England and Romania, a game the Pumas won 43-8 on Saturday, showing the strength in depth of Argentina's pack. But Scelzo believes Scotland have the same options up front. Euan Murray is set to miss out as he does not play on Sundays for religious reasons, but Geoff Cross and Moray Low - tighthead when Scotland won the June 2010 Test series in Argentina 2-0 - are more than capable deputies, according to Scelzo. He said: "Scotland have many good props. The two times Scotland won in Argentina, he (Murray) wasn't on the field. "It doesn't depend on one player." Argentina are not out for revenge for the losses in Tucuman and Mar del Plata and are merely looking to win the game, according to Scelzo. He added: "Both games are in the past, we are now focused on the present and this week's game against Scotland - we need to win that game."